I've read and reviewed all of Rhiannon Held's books, which means she's going to have to hurry up and write more stuff so I can read it. I've been a fan of Held's work since Silver (2012), which was introduced to me for an interview on The Skiffy and Fanty Show, and have reviewed both Silver and Tarnished (2013). Her latest novel, Reflected (2014), is a solid continuation of the series and the culmination of Held's slow move towards the social questions with which her werewolf society must struggle. 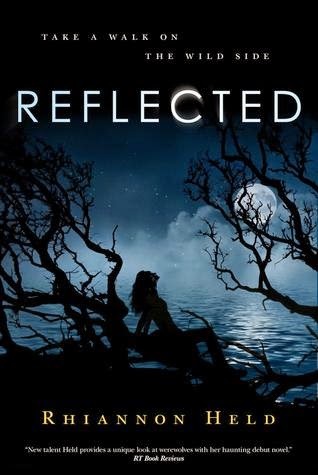 If there's one thing to be said about Reflected, it's that it really ups the ante when it comes to its examination of the position of women within Held's secret world of werewolves. For a book which is deceptively just another urban fantasy novel, this one actually raises some brutally serious questions. Does a pregnant werewolf have the right to keep control of her pack if shifting to were form might threaten her child's life? How do werewolves handle custody concerns when the mother isn't a were and doesn't know her child isn't like her? How well can a woman with a severe disability hold her own in a male-dominated field of power? Held handles all of these issues without simplifying or taking a pure, hard-lined ideological stance. That she does so is notable not because it avoids that annoying "eww, message fiction" canard, but because it adds a certain nuance to an issue which, for many, is almost always presented like a "yes" or "no" question. Here, the answers have ramifications. Whatever choice Silver makes, there will always be threats to her own power (and every other woman's) down the line, as each action has an opposite effect. This has all been a long time coming, to be honest. Each of Held's previous novels have slowly leaned the POV to the women in Dare's life, and here, the women are completely central. They are the POVs. They are the ones making decisions. They are the ones dealing with the conflicts. Dare isn't entirely sidelined, of course. He is forced to return in the end to deal with the consequences of Madrid's -- and Felicia's -- meddling, which has put Silver in an emotionally compromised position. Given Silver's past, it makes sense that Held would not opt for a new-and-improved Silver that can simple will her limitations away. If her physical limits are not enough -- she cannot shift to were form -- then her fragmented personality certainly provides the necessary limits to keep her character realistic in the context of what happened in the preceding novels. I have always loved Held's willingness to make her characters flawed and even weak in certain contexts; much of that still exists here, particularly for Silver, who must face a psychological trial that could destroy her fragile sense of identity. Though the focus on women in this novel is solid, I must admit that I don't think Reflected is the strongest of Held's three novels; Tarnished may not be as tightly plotted as Reflected, but its character development is, with one small exception, better realized. In Reflected, we're given a personal look into Felicia's mind, a place we haven't been before because Felicia didn't actually appear in the flesh until the last third of Tarnished. Here, Felicia's past inevitably sticks its head in her business, putting her into a compromised position in relation to her pack. But this also means the reader is left without enough anchoring material to really sympathize with her plight or to understand or respect her decisions. Felicia makes so many obvious mistakes that it's difficult to think of them as simply a consequence of her age, particularly given her years of life with a North American pack and her father, which, you'd think, would have instilled some sense of loyalty or at least, in light of the fact that she knows Madrid manipulated her for most of her life, that European were are not trustworthy by default. The novel is strongest when it is focused on Silver and Susan -- women who are determined, capable, but also flawed. Felicia, however, is flawed only because she has no sense of judgment; this is not explored with as much depth as the other elements I have already discussed, even though it should have been. That said, Reflected is tightly plotted -- more so, as I mentioned, than Tarnished -- and well paced. Even as things become increasingly complicated by the convergence of multiple subplots, Held keeps things together and makes a beeline for a conclusion that, while expected, was mostly satisfying. Some questions are left unanswered, but I get the impression that they are left as such to convey the immensity of this world-within-a-world (and, perhaps, to leave the story for further novels). It's a world I'll keep coming back to. There's one simple reason that I keep reading and enjoying Held's novels: they are the kind of urban fantasy that I enjoy reading. Tarnished and Reflected each give me everything I want without getting trapped in a formula that, to be honest, bores me. Reflected fulfills the promises Held has offered in the preceding books and digs with a literary bulldozer into the inner workings of a werewolf society on the verge of major social change. That's enough to keep me reading; I hope it's enough for everyone else.